ThePackard Bell EasyNote range might not be as front-and-centre as Dell's Inspiron or HP's Pavilion brands, but nevertheless has established itself in our minds as a home for mid-level laptops at budget-level prices. And we're happy to report that the EasyNote TS11-HR-695UK is a similarly reliable slice of mid-level computing goodness. It shares the same floral pattern as other Packard Bell EasyNote laptops. There are also a range of colours to choose from, but the pattern is harder to pick out on the black model than the red or white versions. The pattern continues on the palm rest inside the laptop, although the keyboard and rest of the chassis is matte black. The keyboard itself is a full-length affair with an additional numerical keypad and a couple of extra hotkeys thrown in. The chicklet keys are great for typing on and the overall experience is excellent. There are no issues with odd-sized buttons as common keys like Enter, Backspace and Shift are all well-proportioned and where you would expect to find them. The touchpad has the same glossy coating as the lid and palmrest and is a little on the sensitive side, although you can adjust this in Windows. It's not the largest around but the single click button works well. Unlike the bigger TS13 models, the EasyNote TS11 sports a smaller, Intel Core i3 CPU which works to keep the cost down. However, in terms of performance, we were impressed at the 8159 score this machine posted following our benchmarking tests. Even though it's the budget choice, this dual-core chip will give you a smooth experience when multitasking. Thanks to a capacious 6GB of RAM we had no problems quickly working around several documents, even with multiple web pages open and music streaming. Graphics are handled by the integrated graphics chip bundled onto the Sandy Bridge CPU and provides a reliable, if basic, experience. You can safely manage older games and a spot of photo editing but beware of anything more demanding. Connectivity is similar to other laptops at this price point. There are three USB ports for peripherals and HDMI and VGA connections for external displays. You can use the 802.11n Wi-Fi connection or the Ethernet wired port for connecting to the internet and there's a Kensington security slot for locking the EasyNote TS11 securely. There's no doubt that the EasyNote TS11 is a friendly machine. From its decorative pattern, to the social networking hotkey, this seems like a safe choice for a mid-level laptop. Beyond that, though, there's some serious performance underneath. 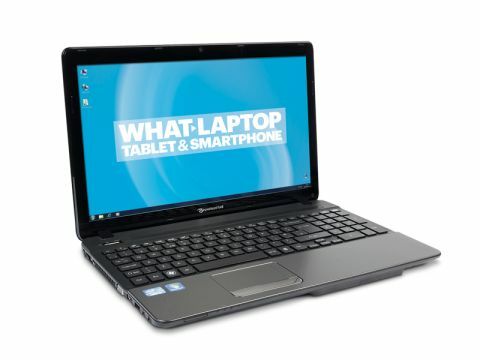 For this price point we reckon the Packard Bell EasyNote TS11 stands as a secure and reliable purchase.